Summer is in full swish here in the great NW! I know that most of the country is getting cooked right now, but here in Portland it's been hanging around the mid-70s to low 80s. Very nice. Anyway, let's put on some cool, fun records, shall we? Yes, let's. 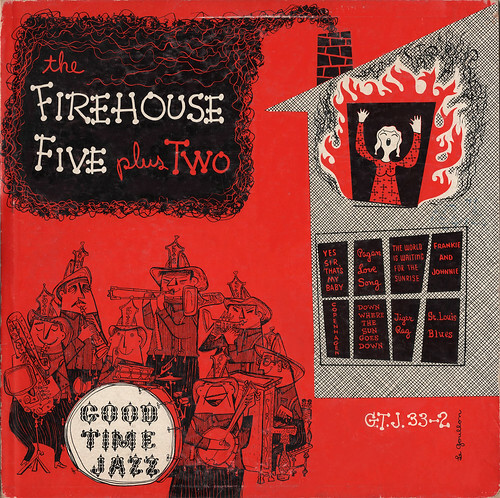 The Firehouse Five plus Two: Good Time Jazz (sometimes listed as "Part Two"). 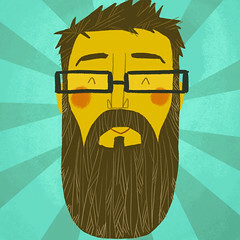 Illustrator listed as "Le Goullon." Even though liner notes say: "During 1950 (when the eight numbers on this LP were recorded)...", I've been told that the LP was probably packaged and released in 1953. The Firehouse Five plus Two was a dixieland jazz band that played around the LA area (and beyond) from the late 40s on into the 70s. The band is of particular interest to us animators mainly because most of the members worked at Disney at the same time - most particularly, Ward Kimball and Frank Thomas, two of Disney's "Nine Old Men." Clark Mallery and Ed Penner also worked there, while Harper Goff was an art designer for several movies (for instance, THE THING). 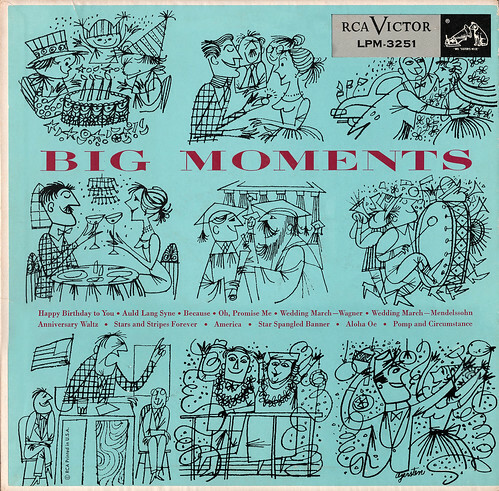 Big Moments LP, 1955. Cover illustrated by the awesome Gerry Gersten. The dude is still alive at 84! Did caricatures for MAD Magazine, NY Times, TIME, Newsweek, Rolling Stone, you name it. You can always tell if illustrations like this are done by serious artists or not. Here, I can tell by the way he draws the arms, faces, the details in the clothing, dresses, etc. Very intricate linework that can't be duplicated by anyone with lesser talent. Believe me, I've seen some illustrations (like in vintage cook books) that look pretty pathetic. Here, though, Gerry does some wonderful work that's upbeat and lively. 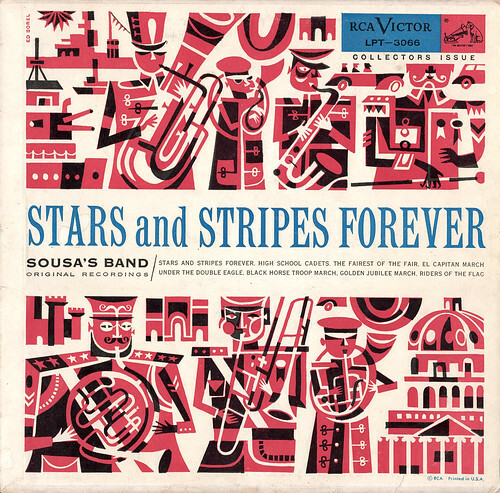 Stars and Stripes Forever (1954). I know I'm a little late on the July 4th thing, but it's better late than never, right? Very Jim Flora-ish, it's illustrated by Ed Sorel. Interesting to see such a different style than what Ed's usually known for. 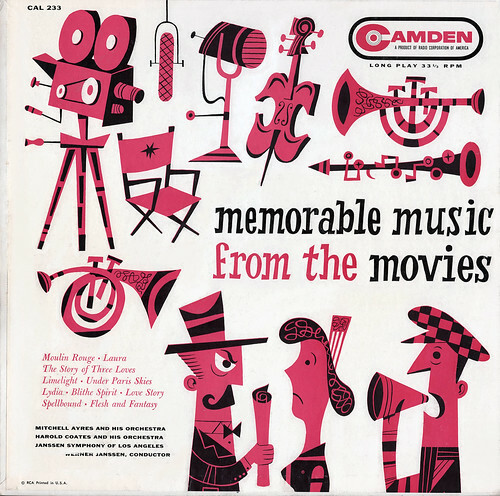 Memorable Music From the Movies (1956). Illustrated by the one, the only Jim Flora. Sometimes you just never know with these covers, since I've seen many who would rip-off of Flora's work (see this one for example). However, just found out that this is, indeed, a genuine Flora cover. Here's a list of his covers, in case you might have one in your collection. You never know! Self promotion is always a tricky thing. A great deal of artists I know hate to do it, or are just too busy to figure out a decent way to do it themselves. I'll be talking about this particular subject, along with a bunch of other things having to do with freelancing, being an artist and illustrator, children's books and publishing, as well as making the transition from full-time to freelance on the blog soon. All of this will be discussed just as soon as I finish up these books and get a few nights of decent sleep. So, stay tuned! By the way, if you have any questions in regards to what I've mentioned here, or if there's something you'd like to talk about on this blog, drop me a comment or email (see profile page or my website) and I'll bring it up in conversation. Until then, I'll just go ahead and head back down to the basement.